Begin your adventure with a continental breakfast during the ride out to Molokini marine preserve aboard a fast and stable catamaran, the Lani Kai. Here at the preserve, while you are snorkeling, the crew will prepare a deli-style lunch for you to enjoy. After you are done snorkeling at Molokini you will depart for the Makena area along the southern coastline of Maui. This area is nicknamed Turtle Town because of the abundant population of Hawaiian green sea turtles. Snuba is offered at an additional cost of $50 and should be reserved ahead. Operates: Daily: 7:00am to 12:00pm. Includes a continental breakfast of bagels and cream cheese and tropical fruit. Create your own gourmet deli lunch with choice of turkey breast, roast beef or honey baked ham, cheeses, breads, lettuce, tomatoes, sprouts, pickles and onions. Homemade pasta salad ,coleslaw, fresh veggie tray with ranch dip, broccoli, cucumbers, celery and carrots. Chocolate chip macadamia nut cookies. Inclusions: All snorkeling gear, instruction and flotation devices are provided. There are some prescription masks (2.0 to 7.0 available), but please ask. Beverages and snacks will be available. Beer and Mai Tai's will be served after snorkeling. Pride of America Cruise Ship: Friendly Charters Lani Kai Molokini Tours will not pick up cruise ship passengers at the cruise ship dock. 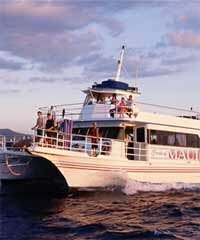 These Molokini tours can be reached via a taxi or Tom Barefoot's Tours could arrange for a rental car shuttle to pick you up directly at the dock. Lani Kai snorkel trips can be organized for the Monday of your cruise ship schedule. Please book well in advance to assure availability. There have been 69 reviews written about the Morning Molokini and Turtle Town Adventure with Friendly Charters. My husband and son thoroughly enjoyed their snorkeling experience on the Lani Kai. The crew, the food, and the snorkeling were all exceptional. This was our favorite tour. The location, staff, food, drinks, equipment (SNUBA!!! ), everything was perfect! Thank you for recommending them! Our whole experience was amazing! We did the Snuba and would definitely recommend it! We were even able to purchase underwater pictures from our Snuba dive. The whole staff was very friendly and accommodating. I would definitely recommend the Lani Kai/Friendly Charters! weather wasn't the best that day but the boat and crew were nice. a GREAT tour. I have worked in this industry myself, and the boat and crew were excellent..much nicer than the larger, more crowded boats around us. The instructors were experienced and knowledgeable, the crew was very friendly and helpful. All in all, I can not think of anything I would change. Great day! The tour was great! The staff was very helpful and friendly. On the way back we came across a pod of dolphins and the captain went out of the way and spent an extra hour following the pod so the dolphins could play in our wake. We thoroughly enjoyed our morning tour. The boat was very accommodating and while the winds prevented us from going to the Molokini crater, the Captain took us to a plan B snorkel site where we could see turtles. As a bonus, we also saw some rare monk seals basking in the sun. We really enjoyed this snorkeling tour. Many other tours only go to Molokini, but this one took us to turtle town too. And the deli breakfast was also good. Very nice. Boat was clean and staff helpful. Disappointed we didn't see many fish though. Very Nice, everything we were hoping it would be. Skipper had to take else where because of weather conditions but that was ok, we still had fun. Your process was easy and straight forward. Thanks. This tour was great. As a first time snorkeler, I was a bit nervous but the crew spent time with me and were very encouraging. The one negative that I wish somebody had mentioned was the fact that the Maalea harbor charged to park. By the time I figured out where to pay, I was late getting on the boat and missed the beginning of the instructions by the boat captain. Awesome tour. Came at the very beginning of whale season (technically one day early) and were still surrounded by whales going back into the harbour. The snorkeling was great around molokini and almost better at the second dive. The snuba was better than either my wife or I had anticipated. The crew were very friendly and our snuba instructor even gave us details on a killer hike after we got off the boat. Definitely recommend these guys for sure! Great overall experience. Everyone was terrific and provided superior customer service. A 5 star rating. Great recommendation Trish! Great experience on the Lani Kai!!! Still my favorite Molokini Snorkel! We really enjoyed the snuba and Due to my allergies I could not eat the food. The staff were fantastic and the drinks were great. The price was very high considering we could only go to one location. I booked over the phone for snorkeling and snuba and when we got on the boat. Amazing tour! We had a great time, the crew was so friendly, made us feel right at home and gave us helpful advice for the remainder of our trip. The one thing I was disappointed in was that they charged us for the wetsuits. The tour was fairly expensive and we couldn't stay in the water without the wetsuits for more than a few minutes, so I feel like they should be included. This was our first experience snorkeling. We know we could have rented our own gear and snorkled out at Makena, but this was by far the best choice we made. Our guides were friendly, didn't treat us as "just another tourist," and provided great spots for viewing sealife. We liked it so much, we are booking again for six weeks AND bringing along two additional guests! By far, a great company, great service, friendly and professional. Worth it. Drinks and Sandwiches were very good! Girls were very polite and Helpful! We had a blast! Great experience. Booked very late and were happy to get the last two seats. Great tour! It was my first time snorkeling and can't wait to do it again or SNUBA! A special thank you to the crew for helping my mom acclimate to her first time snorkeling and check off a item on her bucket list. The crew was friendly, helpful and accommodating. My only suggestion would be to have a larger selection of food for people that have food allergies. Thank you so much for the awesome experience!!! MUst -do trip with best team ever. Friendly stuff with so much professionalism. It was a great day. I wish I do it again and again. Snorkeling and Snuba was awesome! The crew and captain on the boat were very accommodating and friendly. Snuba instructor Maricella was very patient and made everybody feel comfortable. I would definitely do this again. We had a great time! One of the highlights of our trip! Lani Kai/ Friendly Charters was incredible!! The staff were wonderful and very attentive. I got sick on the water and they immediate sensed something was wrong and attended to me. We had a great time on this snorkel trip! Really enjoyed the crew and great spots they took us to! Thanks for helping us book another great trip tom! Not only was the trip on the Lani Kai wonderful, working with Toms barefoot was the best! We had a beautiful perfect day to go out on the boat (even though it IS early I would recommend the early tour) Even Haleakala was clear to the top so we could see the sun rising over the mountain!! The water was super clear so great snorkeling. The Toms organization was wonderful to work with. They called to check on everything the day before because we had some bumps in the road (and emergency room visits )with some of our party. That call was helpful, reassuring, and unexpected. One thing we learned at the harbor is the even numbered berths are on one side and the odd the other so keep that in mind as you arrive for your trip! We had a wonderful time on the Lani Kai snorkeling trip. We thoroughly enjoyed our snorkel tour. The staff was amazing...accommodating and helpful in every way. We saw so many beautiful tropical fish, eels, coral and more at Molokini and were not disappointed when we got to see several sea turtles at turtle town. It was a fantastic experience! Tom was very helpfull and found for us the best provider. My son and I had a great time on this tour. The staff was wonderful. Highly recommend the snuba, it made our trip. Saw everything we wanted including coral, turtles, even spotted a couple of whales. Awesome. We had a great time. A bit disappointed with Turtle Town but enjoyed Molokini. Staff was wonderful. We had the best time on this snorkel trip and it was our first time snorkelling and we are addicted! Great staff and equipment. Lots of food and drinks. Awesome day! Because the weather wasn't ideal, we didn't reach Molokini. However, the captain rerouted to a couple beautiful snorkeling areas. Plus, we saw whales close up. Great trip. Great crew. Plenty of food and drinks. Lots of fun. I would go again. The captain and crew were very professional and friendly. They worked very hard at insuring that everybody had a good time and very helpful. You won't be disappointed to book with them. Friendly Charters made our experience really special. All of the crew went out of their way to make sure everyone was taken care of and having a great time. Molokini was really rough the day we went so we only snorkeled there for a bit then moved to Turtle Town which was much more pleasant! The boat was a bit crowded but there was a place for everyone to sit so that was not a problem. Two restrooms on the boat. Plenty of snacks to keep everyone fed and hydrated. After snorkeling, complimentary beers and mai tais were very cool! I felt a little sick so I didn't partake but my wife loved the mai tais! The snorkeling was phenomenal, and the snuba was very cool, a bit pricey. I highly recommend this experience, especially if you've never done it before! Warning one person on the boat did get very sick, so be aware if you're easily sea sick. Rest of the people seemed to enjoy themselves the whole time. Much mahalos to the captain and crew, they were phenomenal! Our group of 7 ranged from experienced divers to a 2 year old. We all had a great time. Our toddler grand-daughter got in the water and floated with her mom. We saw two eels fighting and several octopii. Colorful fish were abundant. There was a lot of food for both breakfast and lunch. The pasta salad was excellent. The Mai Tais were tasty. We recommend this trip for everyone. Capt. Mack and the crew did a wonderful job, even though the day was a bit rough and windy. Snorkeling at Molokini was great. This boat is just the right size - not too big but with all the amenities. Also, you are not as restricted as to how far you can venture from the boat. Be sure to do the morning trip. Really don't need the wetsuit; costs extra. But a rash guard would be helpful. Would definitely book them again on another trip. Absolute best excursion I have ever been on. My husband and I have never been snorkeling, or to a tropical island before. I was scared out of my wits to enter the water, but the staff offered help, tips, and comforted me, so that once I got the hang of it, I just loved every minute. It was a little overwhelming at first, I couldn't stop trying to breath through my mouth, but after a few failed attempts, I relaxed. The amount of time at both Molokini and turtle town, were perfect. I didn't realize how hard it would be to swim back to the boat with the current against me at turtle town, but again, I just relaxed, and powered through. We saw so many beautiful fish, and a couple of turtles too. On our way back we encountered a whale and her calf, an added bonus for that time of year. The food was nothing exceptional, but it wasn't what I went on the trip for. The drinks knocked me for a loop, which I was expecting, but after a couple of hours in the water and sun, I guess I should'nt be surprised. My husband was thrilled to swim with the turtles, which was an added surprise of this excursion. Did I mention all the crew were super friendly, and wanted to make sure you had a great time, and were comfortable. They also offered Snuba for an additional fee, which we didn't do, as I was already nervous about the whole trip to begin with. I didn't mention that I almost didn't get on the boat, but a friendly passenger helped me relax, and made sure to keep an eye on me. I don't think I would have taken the trip if she didn't calm me down. We did use motion sickness patches, and neither of us had any issues. One other thing, they offered rentals of wet suits I think for 10.00 each, what I didn't realize is with a wet suit on you can't sink. An added bonus. It also kept you a little warmer in the water, which probably wouldn't have been an issue, but I appreciated being warm in the water. I would do this excursion over and over, and now am looking for other islands to visit to snorkel. Thank you Tom Barefoot, for all your help in choosing all of my excursions, and Lana Kai, for an absolutely lovely trip. One for the memory book. We took barefoot morning Molokini snorkeling trip and it was awesome!!! The clear blue water, corrals and fish swimming around me made me feel like I was inside of an aquarium!!! The boat name "friendly charter " really refers to every crew member, they were super nice! But this trip would not have possible without the help of SANDRA, An employee from tombarefoot who helped my entire family book last minute trip from doing atv and this spectacular Molokini adventure. As we all know last minute booking specially this peak summer season is impossible but SANDRA made it happen for us!! FROM MY FAMILY, WE THANK YOU SOOO MUCH SANDRA!!!! Great Charter! Fantastic crew. Little disappointed that we had to miss Turtle Town but if the visibility is poor, then it is what it is. Instead we spent 2 hours at Molokini. This, to me, is too long to spend at this location. Way to many people crammed into the area. To me, that translates into less underwater life to observe and getting bumped into too many times. Still saw lots of cool stuff and got some great pictures though. I booked several last minute tours through Tom Barefoot's and they were awesome. They found tickets where everything else was booked. They were kind and helpful and I will use them again. The snorkeling and snuba trip was the most amazing thing I've ever done. I was so so glad Lani Kai Friendly Charters had Snubaman on board with the offer. He sent me home with a disc of all the pictures he took underwater of the turtles, fish and me! Best experience of my trip. My husband and I very much enjoyed the snorkel trip. The crew was fabulous! I would recommend this charter!! Great day on the Lani Kai. The crew was super helpful, easily getting us prescription goggles and taking care of any other concerns. Food was fine, nothing fancy, but we did not come for the food. Captain did change second stop from Turtle Town to Coral Garden on our trip. We had already seen a bunch of regular fish and pretty coral at Molokini, so my family would have preferred Turtle Town. Otherwise, great trip at one of the more reasonable rates. Overall a great experience! Great views and excellent staff. Would definitely recommend this company to my other friends. Best part was doing the snuba and getting the resulting pictures! Very good!! Just join it!!! In general, the Morning Molokini and Turtle Town Adventure with Friendly Charters was fine. Friendly and helpful crew, snorkeling locations were ok. We only saw 1 turtle that day and not too many fish but appreciate the boats do not have a lot of control in that area. I did upgrade and pay more for this particular boat b/c it had " water slide". That said, I would not do that again as the slide was nothing to write home about and definitely not worth the addl $. We've taken other boats which were equally good if not better and less $. A very nice adventure. It is extraordinary to have the opportunity to see such a vast array of life in its natural habitat. The crew of the Lani Kai were friendly, helpful and knowledgeable about everything, answering all of our questions and making us relaxed. If you have the chance to enjoy this outing, don't miss it. The crew was incredible! Good service goes a long way and I highly recommend using Friendly Charters. We had a great time! The crew knew what they were doing and were very friendly! To top it off, they fished on the way and managed to land a nice Ono! Super tour! I highly recommend it!!! Professional and friendly staff! Perfect snorkeling trip. We saw the colorful fish and turtles that were promised plus dolphins and a whale. The staff was helpful and the food was perfect. GREAT,GREAT,GREAT--We will use Mark & his boat next time.We hope the weather will allow a trip to Molokini. Loved the trip, the crew were wonderful. I could go on and on ... but suffice it to say the tour was AWESOME! A blast from start to finish. Great snorkeling, great fun!!! Fantastic from start to finish. The crew were very welcoming and competent. The size of this boat was just right for us (not too large or too small), and this made for a relaxing and personal experience. Don't miss a day on the Lani Kai! Captain Kawini and his team were fantastic. One mask was not the right fit, so they gave us a better option and some great pointers. We saw lots of tropical fish including a puffer fish!Several turtle sightings also, but not up close. Highly recommend a trip on the Lani Kai - good food and the Mai Tais we flowing. Nice also to be on a smaller boat with fewer than 50 people. My husband and I had the best time on the Molokini Snorkel tour. Friendly and helpful staff. The captain was great and had a laid back but professional demeanor. One of our favorite memories made! It was great. After Molokini they took us to a spot for turtle watching that almost no one else goes to. We spotted 2 turtles and lots of fish and coral. The Maitais were also very good. A pretty good tour...guides and staff was amazing. Sadly, when we went to "Turtle Town" there was not 1 turtle! Ummmmm...did someone forget to tell the turtles we were coming? We spoke to other tours that saw 50-100....not sure if we didn't go to the proper spot or what happened. Pretty disappointed with that part of the tour. Everything else was great! Friendly Charters provided a great adventure to Molokini and Turtle Town snorkeling. The boat crew did a fantastic job helping the guests have a great time. Thanks Tom Bearfoot for reaching out to me with a personal phone call! Excellent tour for the money. We all enjoyed the boat ride to the snorkeling and saw many turtles in route as well. Our Captain Mike & his crew were excellent. Food on board was very good & crew hospitable! Would highly recommend. We will use the same tour next visit to Hawaii! We were disappointed in the excursion because we did not make it to Molokini. So pleased with our experience and would definitely recommend. The staff was amazing. So friendly, knowledgeable, helpful and fun. The boat was great. Roomy and clean. We will book this again the next time we visit. Added bonus was all the whales we saw and even heard from underwater.